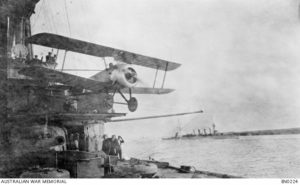 HMAS Sydney and Melbourne are patrolling the Heligoland Bight alongside British warships when they came under attack from two German seaplanes. The destroyers each launch a Sopwith Camel fighter to intercept the German aircraft; the first time that Royal Australian Navy aircraft are used in combat. 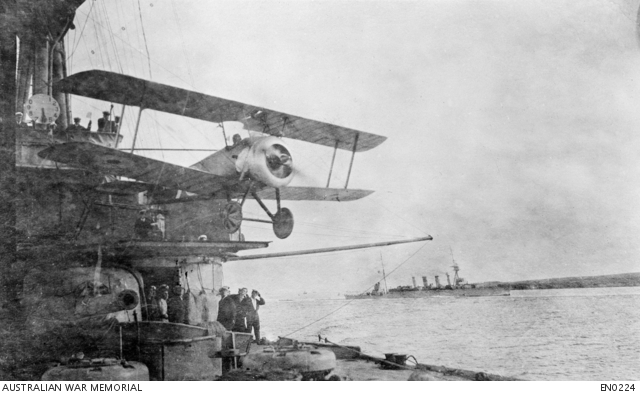 A Sopwith F1 Camel biplane aircraft takes off from a platform above the forward gun mounting on HMAS Sydney in 1918. HMAS Melbourne can be seen in the background. Image courtesy Australian War Memorial.